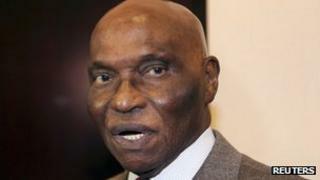 Senegal's highest court has dismissed opposition appeals and confirmed that President Abdoulaye Wade can run for a third term in office. The Constitutional Council said the 85-year-old president was not bound by a two-term limit because his first term began before the rule was introduced. There were violent protests after Friday's original ruling that Mr Wade could stand in the February poll. The court also barred singer Youssou N'Dour from standing. Two other opposition candidates also lost appeals against Friday's court rulings blocking them from standing in the February 26 election. The court had argued that it could not verify many of the signatures Mr N'Dour had gathered to support his candidacy. The ruling was a "constitutional coup d'etat", the singer said. "Senegal and its people are sick. We have been betrayed by this shameful decision. I say shameful because neither the will of the Senegalese people nor the opinions of experts in constitutional law have been heard. Mr Wade has imposed his will and won the day," Mr N'Dour said. Security has remained tight in Dakar following Friday's clashes between opposition supporters and government troops. Opposition parties and activists met on Sunday before the Constitutional Council's final decision was made public. They said they would continue with "national resistance" against Mr Wade's bid.